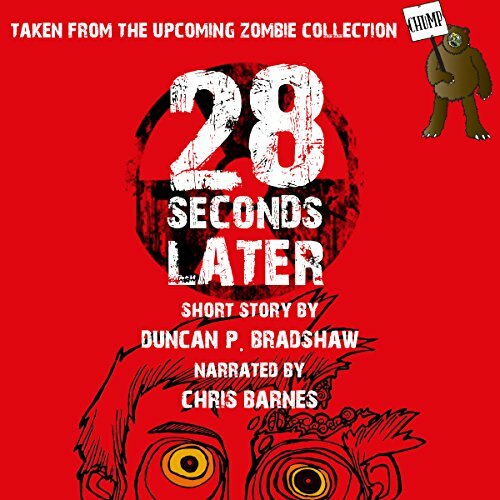 "28 Seconds Later" is taken from the upcoming zombie collection, Chump, by Duncan P. Bradshaw, released on 12 November 2016. Finally, the true story behind the Eastern Bloc boycott of the Los Angeles 1984 Olympics is revealed. Brace yourself for an inspection of the top secret Khimki Sports Preparation Facility in the Novogorsk district, near Moscow. Just another normal day of injections, feats of sporting excellence, and a Scottish super-spy. There's a fine line between infection and zombism. Would you try another book from Duncan P. Bradshaw and/or Chris Barnes? Anything that is not by this author. No, But I am sure it's because he died after reading this story. What character would you cut from 28 Seconds Later? In no way was this story connected to the 28 Days Later franchise, except that they mention it in the story. I think this story is maybe a satire, but it fails at that. It has to do with a some Russians who are drugging Olympic athletes, but they turn into uber zombies and a satirical James Bond character shows up who talks about needing to get laid before the Russians shoot him. The authors mention how the "Zombies"/"infected" will need to poop first before going after more scientists. I dunno. This is literally the worst short story I have ever listened to. I paid a little over $2 and I feel genuinely cheated. I would not waste a coupon on this story. This is literally an author naming his story after something that is actually successful. Loads of fun, very entertaining, great narration. Where does 28 Seconds Later rank among all the audiobooks you’ve listened to so far? It is definitely the best short story. Overall it ranks very high as it is fun and very original. What was one of the most memorable moments of 28 Seconds Later? The introduction of the British spy with the "familiar" accent. I enjoyed the use of his native dialect to voice the British spy, but also how he managed to give each character a slightly different voice. I'm not sure about "moved", but I certainly enjoyed every aspect of the story. From the Cold War setting to the way the author tackles an old trope, taking inspiration from a certain movie franchise and putting his own stamp on it. It has its own originality and style which was a great deal of fun.